Laser lithotripsy is a procedure to break apart kidney stones in the urinary tract. It is done with a ureteroscope passed into the tubes of the urinary tract. Incisions are not needed. The laser breaks the kidney stones into smaller pieces that can either be removed by the surgeon or pass out of the body in the urine. 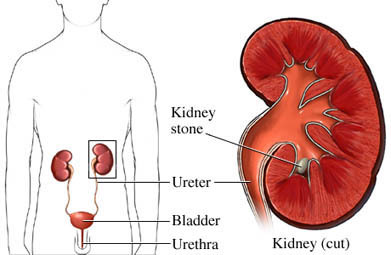 Kidney stones can become trapped anywhere in the urinary tract, including the kidney and the ureter. The ureter is a tube that carries urine from the kidneys to the bladder. If a stone gets stuck in the ureter it can cause a blockage and the back-up of urine into the kidney. They can also be quite painful. Laser lithotripsy is used to break apart the kidney stone so that it can pass through the ureter. The pieces will either be removed by the surgeon using a special basket or left in place where they will move from the ureter to the bladder, then out of the body with the urine. Arrange for help at home during recovery. Stop certain medications up to a week before the procedure. Avoid eating or drinking after midnight prior to the procedure. Talk to your doctor about any allergies you may have, or what medications or supplements you currently take and may need to stop. General anesthesia will be used. You will be asleep through the procedure. A ureteroscope is an instrument with a long thin tube that is hollow like a straw. The doctor can use this scope to view the urinary tract, find kidney stones, and pass instruments to the stone. The scope enters the urinary tract through the urethra, the tube that carries urine out of the body. The scope continues to pass through the urethra, bladder, and into the ureter or kidney (if necessary) to access the stone. Once the doctor sees the stone, a fiber will be sent through the scope to the stone. The fiber can create a laser beam to break up the stone. Small pieces may be removed using a basket that is passed through the scope. Small sand-like pieces may remain and will be gradually passed through the urine. A temporary stent may be placed in the ureter. The stent will keep the ureter open, improve urine flow, and help the stone pieces pass. The stent will be removed after a few days or weeks. Anesthesia will prevent pain during surgery. The ureter and bladder can spasm, and cause pain after the surgery. There may also be some pain or discomfort in the back. Stents can also cause discomfort. Pain and discomfort after the procedure can be managed with medications. Full recovery can take 1-2 weeks. Fatigue and discomfort is common but will fade during recovery. It may require minor changes to your daily routine. Surgery for kidney stones. Washington University School of Medicine in St. Louis website. Available at: https://urology.wustl.edu/Patient-Care/Kidney-Stones/Surgery-for-Kidney-Stones. Accessed March 8, 2018. Ureteroscopy and laser lithotripsy. University of Florida Department of Urology website. Available at: http://urology.ufl.edu/patient-care/stone-disease/procedures/ureteroscopy-and-laser-lithotripsy. Accessed March 8, 2018.